Year of the Rat starts today. As a toast for the Chinese New Year I made this easy stir fry noodles. My older son was so excited with his present of a red envelope with a coin inside by one of his Chinese classmate. He was so excited that he showed the envelope to everybody and talked about it. The little thing also learnt to say thank you in Chinese. A New year every month, how nice. There will be a break in March and then with April a New year starts in the Tamil and Telugu (?) Calendar. Some helpful soul has found out that the Cambodians also celebrate their New Year in April. If the wise chief minister of TamilNadu could move the Tamil New Year from April to March instead of January, we can have a hatrick of New Years. Now wouldn't that be nice? What would definitely be nice is this noodles and read on to find out how to make it. Cook the noodles according to the packet instructions. Drain the noodles and rinse under running water and dribble some oil(sesame oil gives it a special flavour) in the noodles and mix it. This prevents the noodle from sticking. Heat 3 Tbsp of oil in a very hot wok. Having a hot wok is important for any sir fry. When the oil is hot, put the onions, carrots, garlic and green chillies. Fry until the onions turn brown and then add the chicken. When the chicken is sealed, it is the turn of the mushrooms. The prawn goes in next. Fry for a minute and then add the soy, fish and oyster sauce. Since the ingredients are not seasoned, be liberal with the soy sauce. Lastly add the noodles and give ir a good stir. Garnish with coriander leaves and the peanuts. 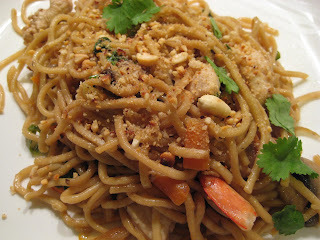 The peanuts add a lovely crunch to this yummy noodle. This noodle is the perfect dish to curl up on the sofa with and watch Master Chef.